The month of January 2017 saw a record number of Hotshots entries. Over 40 photos came in, from the mountains of Northern B.C. all the way to the shores of Lake Superior in Michigan. So many photos made it difficult for our judges to pick just one, but in the end, it was Cynthia Rougoor’s shot from McBride, B.C., that got top vote. She received a Lily Collection Jacket and Bib from Divas SnowGear. Rougoor was on the road, chasing deep B.C. powder through the interior of the province, so we didn’t catch up with her until late February. It was well worth the wait, however, for Rougoor spoke passionately about the sport that has helped soothe her soul. I am originally from Niagara on the Lake, Ontario, but currently residing in Edmonton, Alberta. I am working on my sixth year of riding sleds. I own a 2014 Summit X 154”. I grew up riding quads and tried my hand at dirt bikes but I never got into riding sleds, since southern Ontario isn’t known for its snow. I was lucky to have met someone in Alberta that pushed me to try out sledding. I was taken to Golden, B.C., and was given the key to a 2009 M1000 turbo to try out. It was only my second time ever touching a sled, let alone ever riding in the mountains. 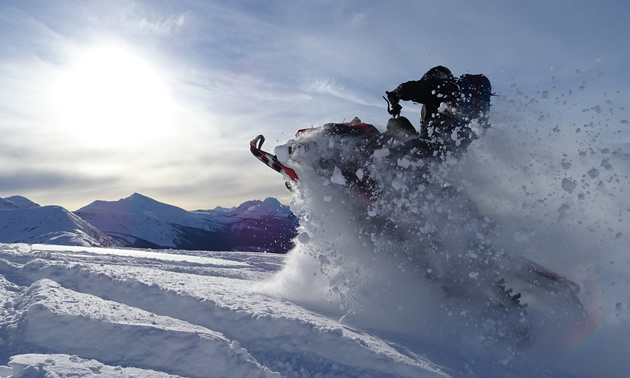 The sound, the views and the adrenalin instantly had me hooked and I started riding a 2012 M8 Sno Pro. 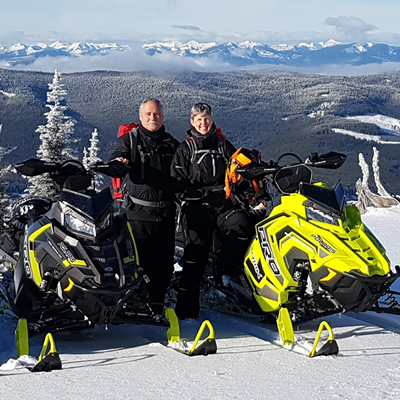 I have been fortunate enough to ride in Whistler, Revelstoke, Blue River, Golden and Sicamous, but spend most of my time in McBride and Valemount. What is your favourite destination, and why? My favourite spot to ride lately has been Renshaw in McBride. It is such a big area and has a mix of all sorts of riding. I can push myself playing in the trees or climbing hills or simply relax in the meadows where I can practise riding techniques. 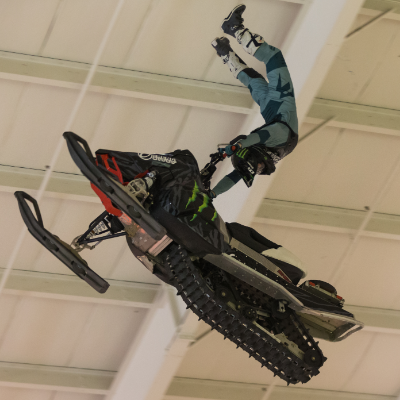 My riding style I would describe as relaxed. 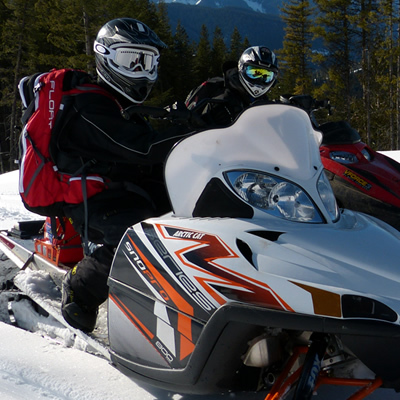 I love spending any sort of time with my sled, from wrenching to riding mountains, or being out on the trails. The whole point is to get outside and enjoy what sledding has to offer. There has been a steep learning curve and I find I am continually pushing myself and learning how to improve and grow. At the start, I used to smash trees and modify the front end of my sled, but after practising over and over again I feel like I have progressed over the years. Not only do I want to keep up with the guys but I want to surpass them and show them that women can enjoy, participate in, and grow the sport as well. What does your riding group do to stay safe in the mountains? Safety awareness has increased drastically and I am always learning tips on how to be as safe as possible. Before any trip we always check avalanche.ca and the weather to see what level of risk is involved. We all carry radios, which have GPS so that we can see our tracks and are able to communicate with one another—which I believe is crucial. We always wear our safety gear: beacon, avalanche bag, etc. Lately, I am pushing for the guys to buy bright-coloured gear so they stand out and I can find them. All my gear is pink so I can easily be spotted if I happen to be in a tree well. We recently started making riding routes of where we want to go and I make sure we have a safety contact back home that knows what range we are at, our riding route and what radio channel we are on. Tell me more about the day you took this photo. The photo was taken the weekend of the Snow and Mud Mountain Mania 10. It was a great experience since I met a new group of people to ride with. The avalanche risk was considerable so we stuck to playing in the meadows to be on the safer side. We stumbled upon an open area with a drift that would be great for cat walking. The sun was shining and the snow was good so I figured I would play with my camera and see what kind of shots I could get. I told Steve to take a run on his Yamaha and the angle worked out perfect. I couldn’t help but be proud of the photo. 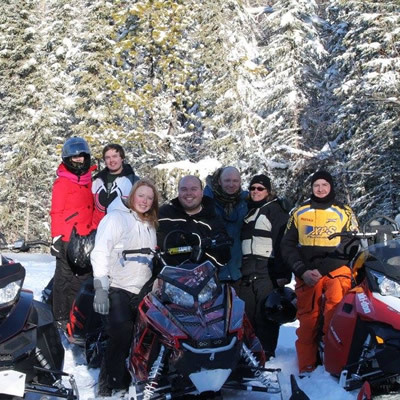 What does snowmobiling mean to you? It is hard to describe just how important sledding is to me. It is a passion and a way of life. Being able to ride provides a peace of mind like no other. Sledding fuels who I am and feeds the soul and yet challenges and discourages all at once. I love every single aspect of riding—the smell of two-stroke smoke, the sound of the engine, the power and speed, the stunning scenery, the frustration of learning new techniques and the opportunity to make new friends. I love how you can pick how your day goes. It can be a relaxing trail ride or it can be the workout of your life. Sledding takes time, effort and dedication but provides no end of satisfaction. I have learned over time that sledding is not only fun but it’s therapy and a great release. My younger sister recently passed away, which has been incredibly difficult to accept, but being able to get out and sled helps soothe a mending heart. It is you and your machine versus the world—where it allows you to stop worrying about all the other things in life and just focus on the one thing that matters, getting out and pushing yourself. The anticipation of a sled trip is what keeps me going—everything from prepping for a trip, even the long drive to get to the hotels, to actually getting out to ride and enjoying the beauty of the mountains. Sledding is what drives me, motivates me and keeps me going, for without sledding I would be lost. To me, it means the world.